I had this idea to that writing Sports History would be similar to writing Military History. I wanted to see if anyone had had that thought before. No. 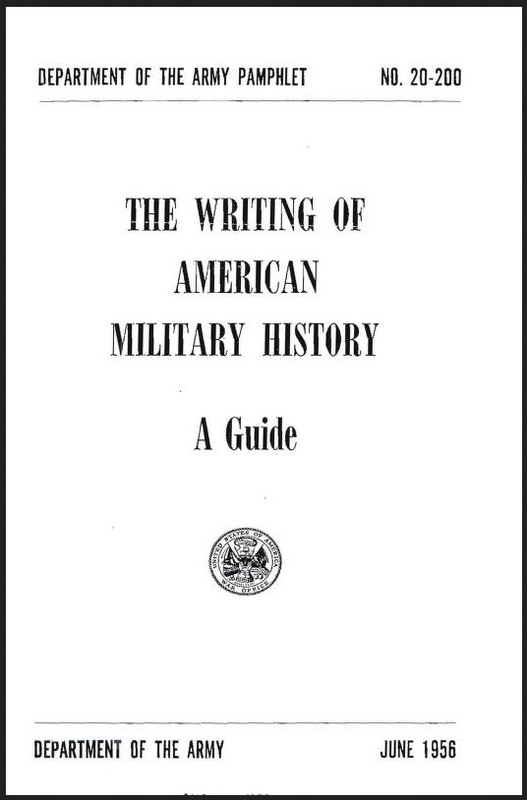 I couldn’t find a lot of info on writing Military History, but I did find this booklet published in 1956 by the US Army on archive.org. Some of tips I was already doing for my Bison Hoofbeats blog. The historical investigation and determining of doubtful facts. This is properly historical research, and has nothing in common with theory. The tracing of effects to causes. This is the real critical inquiry; it is indispensable to theory, for everything which in theory is to be established, supported, or even merely explained, by experience can only be settled in this way. The testing of the means employed. This is criticism, properly speaking, in which praise and censure is contained. This is where theory helps history, or rather, the teaching to be derived from it. In these two last strictly critical parts of historical study, all depends on tracing things to their primary elements, that is to say, up to undoubted truths, and not, as is so often done, resting half-way, that is on some arbitrary assumption or supposition. As respects the tracing of effect to cause, that is often attended with the insuperable difficulty that the real causes are not known. In none of the relations of life does this so frequently happen as in War, where events are seldom fully known, and still less motives, as the latter have been, perhaps purposely, concealed by the chief actor, or have been of such a transient and accidental character that they have been lost for history. For this reason critical narration must generally proceed hand in hand with historical investigation, and still such a want of connection between cause and effect will often present itself, that it does not seem justifiable to consider effects as the necessary results of known causes. Here, therefore, voids must occur, that is historical results which cannot be made use of for teaching. All that theory can demand is that the investigation should be rigidly conducted up to that point, and there leave off without drawing conclusions. A real evil springs up only if the known is made perforce to suffice as an explanation of effects, and thus a false importance is ascribed to it. The critical consideration, that is the testing of the means, leads to the question, Which are the effects peculiar to the means applied, and whether these effects are comprehended in the plans of the person directing? It would be an immense service to teach the Art of War entirely by historical examples… but it would be full work for the whole life of a man, if we reflect that he who undertakes it must first qualify himself for the task by a long personal experience in actual War. Whoever, stirred by ambition, undertakes such a task, let him prepare himself for his pious undertaking as for a long pilgrimage; let him give up his time, spare no sacrifice, fear no temporal rank or power, and rise above all feelings of personal vanity, of false shame, in order, according to the French code, to speak the Truth, the whole Truth, and nothing but the Truth. 1 Clausewitz, op. cit. I, page 130. This entry was posted in History, Military, Non-Fiction. Bookmark the permalink.